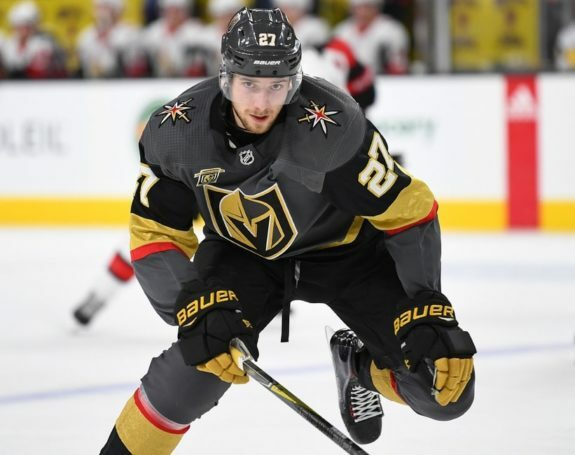 Training camp has officially opened for the Vegas Golden Knights (view the full roster and schedule here) and although much of the roster seems set in stone, there are several interesting battles for a few open spots that will take place in the pre-season. Here’s a quick look. Who Lines up with Stastny and Pacioretty? The first line is sure to stay together, as it should. William Karlsson returns on a one-year, “show me” contract to center Jonathan Marchessault and Reilly Smith. The trio had remarkable chemistry in their first season together and buzzed around the opposing defense with their speed, skill, and hockey sense. Two-thirds of the second line is also penciled in, with prized free agent signing Paul Stastny set at center and new acquisition, Max Pacioretty, lined up to his left. The question is, who plays on their right wing? The early favorite is Alex Tuch, who performed well in his rookie season and seems primed for an upgrade. His size and skill would compliment Stastny and Pacioretty and he could improve on his goal output of 15 from a season ago. 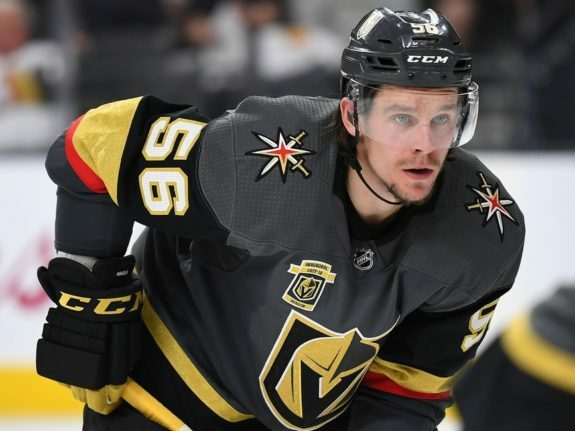 The other obvious candidate would be Erik Haula who spent most of last season as the Golden Knights’ second-line center, putting up 29 goals and 55 points, but received much criticism this offseason for his defense. For his part, Haula is determined to remain a center in the team’s top six but it seems likely he will be bumped down to the third line, setting up the potential for three solid scoring lines. However, he would also be an intriguing piece in a deal for Erik Karlsson and surely Ottawa is looking for scoring. Haula may be especially enticing as his cap hit is a cheap $2.75 million. If he is unable to find a role that suits him in Vegas, he may become expendable. Where Do Haula and Others Fit In? Fourteen forwards enter camp vying for 12 opening night spots. While coach Gerard Gallant seems content to rotate depth players in and out of the lineup to keep his players fresh, they will be giving their all to make sure they hit the ice on Oct 4. If Haula is bumped down to line three, there will be a trickle-down effect. Cody Eakin centered the third line last season and is a good bet to continue if Haula is shifted to the wing. Meanwhile, Oscar Lindberg will look to rebound from a disappointing season and provide some depth scoring in a contract year. 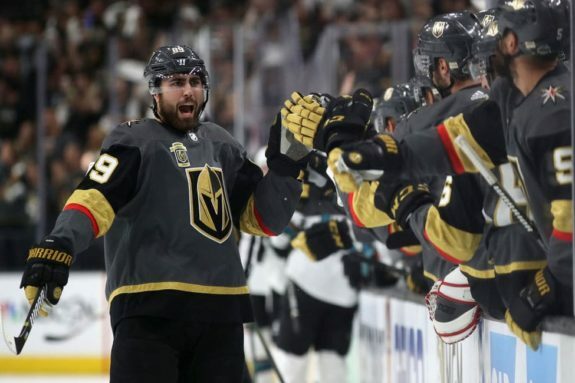 Pierre-Edouard Bellemare and Tomas Nosek were reliable on the fourth line and penalty kill, while Ryan Reaves, with his puzzling $2.775 million salary, figures to be the fourth-line right winger on most nights. William Carrier and Ryan Carpenter are also on NHL contracts and will fight for the remaining places in the lineup. This makes the third-line right wing spot the most obvious open position entering training camp, with any mix of the above looking to fill the slot. Cody Glass (2017 6th overall pick) will also look to crack the lineup but with a logjam at center and no AHL options, he will likely be returned to juniors for another season. Should the team encounter injuries, offseason acquisitions Daniel Carr and Curtis McKenzie will provide depth and be among the first call-ups, along with reliable goal scorer Brandon Pirri, speedster Tomas Hyka, and the physical Stefan Matteau. For the moment, the Golden Knights’ blue line has two holes that need to be filled. Nate Schmidt is suspended for the first 20 games of the season, and Shea Theodore remains unsigned. Both were integral to last season’s success and holdovers Jon Merrill and Brad Hunt will have a difficult time filling their skates. Initially slated as the seventh and eighth defenseme respectively, this could be a “next man up” situation that puts them both in the opening night lineup. Another option is to give younger players a look. Top prospects Erik Brannstrom and Nicolas Hague will be in camp and could warrant their up-to-nine game audition. This also opens the door for prized prospects Erik Brannstrom or Nicolas Hague (or both) to get at least their nine-game tryout before their entry-level contracts kick in. I’d expect the Golden Knights to give Brannstrom a look should the team be unable to come to terms with Theodore before the start of the season. Hague seems like a candidate for a mid-season call-up. Zach Whitecloud represents another option, while fellow stay-at-home defenseman, Griffin Reinhart, and puck-mover, Jake Bischoff provide depth. Marc-Andre Fleury is the starter now and for years to come after signing a hefty extension this offseason, while Malcolm Subban will look to hold onto his backup job and stay healthy this season. Oscar Dansk could push Subban to backup Fleury but Subban would have to clear waivers to be returned to Chicago of the AHL and it’s likely that a team would claim him as Vegas did to bring him to the desert in the first place. Maxime Lagace provides organizational depth at the position, which, as we saw last season, you never know when you might need. The Golden Knights are a club with impressive depth for a second-year program and while the hockey world waits to see if Erik Karlsson is added to the equation, the team is gearing up to defend their Western Conference title with or without him. Can they repeat last season’s unbelievable success? We’ll follow these storylines and more in training camp to see who makes the cut for the 2018-19 Vegas Golden Knights opening night roster.